Austin taxpayers have a rare opportunity to let their voices be heard at a special Citizens Forum hosted by the City Council. We are only about 10 days away from the start of Budget Season. So, we need to let them know that “holding the line” does not mean keeping the tax rate within a fraction of a penny of where it is now. We need full accountability on what the true budget surplus is, including the original $14.2 million plus the money left over from all those vacant staff positions. And we should ask them to use that surplus to cover the revenue shortfall in the Water Utility – instead of passing a gigantic rate increase that would do nothing to encourage conservation. My suggestion is to bring your tax appraisal notices to the forum. Bring your utility bills and your property tax bills. Let the City Council know that “business as usual” will not be tolerated in the upcoming budget. We have Council Member Kathie Tovo to thank as the sponsor of this Citizens Forum. 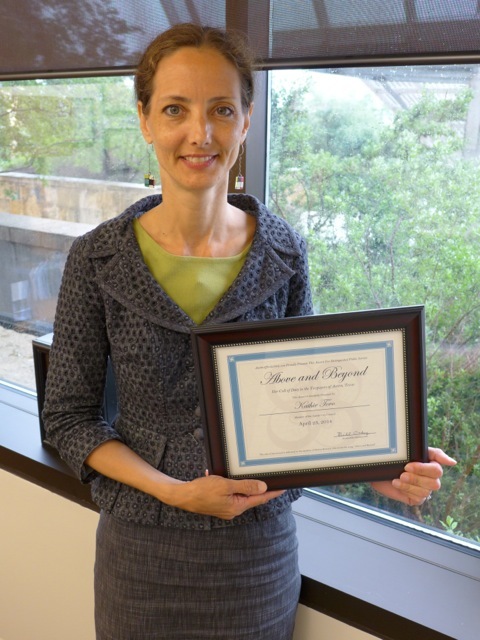 Last month, she was the recipient of the AustinAffordability.com “Above and Beyond” award. Below you will see her picture with the award, followed by the official announcement of the Saturday forum. You and your neighbors and friends can contact the City Clerk’s office (512-974-2210), and make plans to fill the Council Chambers on May 31st with a resounding message on affordability. Let’s tell them with a unified voice that the current spending path is simply not sustainable. Forum will be held at 9 a.m. Saturday, May 31, 2014. The Austin City Council will host a three-hour Citizens Forum, 9 a.m. Saturday, May 31, 2014, at Austin City Hall (301 W. Second St.). Council invites the community to come and speak directly about any topic or issue they feel the Council needs to hear about or address. Tovo’s co-sponsors agree that having a weekend meeting could be more accessible for some people who cannot attend the regular Thursday Council sessions. “We recognize there is a need for alternative opportunities for all constituents of Austin to be able to be heard by their City representatives, and I look forward to hearing from new voices as a result of this Citizens Forum,” Mayor Pro Tem Sheryl Cole said. General Citizen Communication: There are 20 slots available under General Citizen Communication and require registration in advance of the meeting. Sign up begins May 9 either by contacting the City Clerk’s office at (512) 974-2210, in-person at City Hall or by email at citizens.communication@austintexas.gov. Pre-registration closes May 23. These registrations will be posted on the agenda and citizens will be asked to provide a topic in advance to allow Council to engage in a full discussion of the topic. The same rules regarding registration during regular council meetings apply. Open Citizens’ Communication: Participants may register using the City’s Speaker Sign-up kiosks located in the lobby of City Hall. Participants may also register in person beginning at Noon on Wednesday, May 28 through the day of the forum. The number of speakers is limited by the noon meeting deadline or until all the speakers have spoken. Council will only be able to listen to these topics and not engage in a dialogue with the citizens. For both General Citizen Communications and Open Citizens’ Communications, speakers have three minutes, and no time can be donated to be used by someone else. The address for City Hall is 301 W. Second Street. The following Cap Metro routes offer downtown service: 3, 4, 17, 22 or 801. Find schedules and complete route information at capmetro.org or by calling 512-474-1200. Get step-by-step travel directions for using Capital Metro routes with Trip Planner. This entry was posted in Action Alerts and tagged Austin, Austin affordability, Austin City Council, Kathie Tovo on May 20, 2014 by Bill Oakey. Hope you can obtain some good ammo to ‘hold the line’.